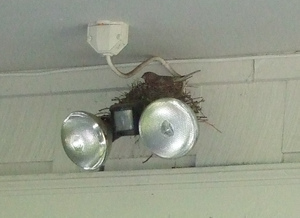 This little brown bird made two nests in the shrubs in front of our house, then built a third nest on top of the garage door light. Third time's the charm, she moved into that one. Mama LBB laid her eggs and is keeping them warm. No little tweety-birds yet.